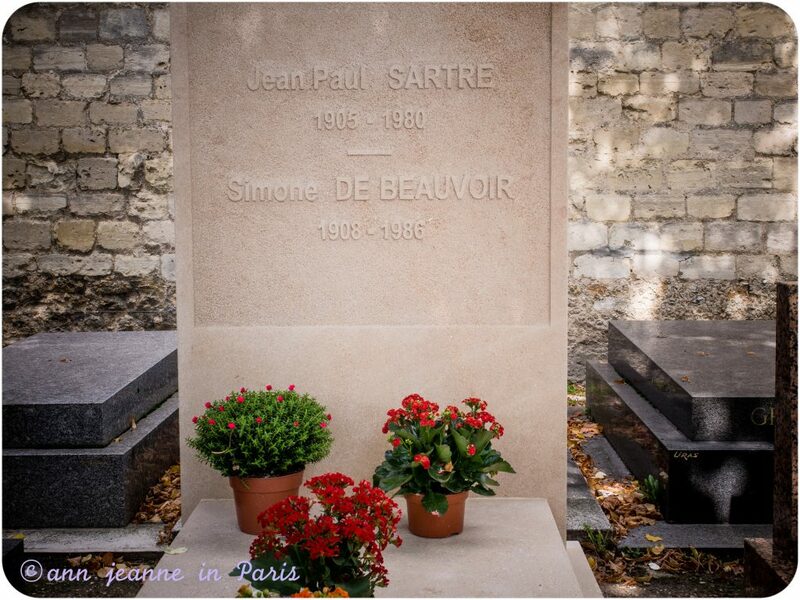 Montparnasse cemetery, the final resting place of many artists and illustrious personalities. 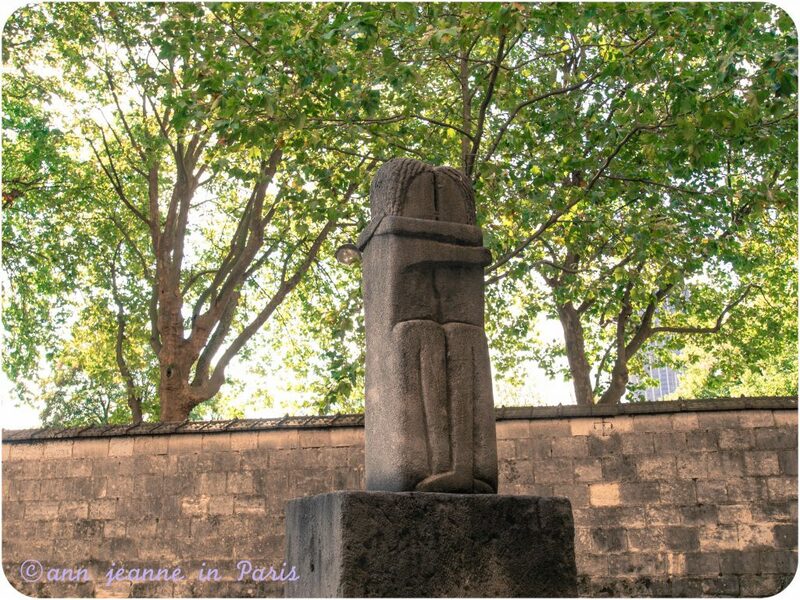 Artists came from all over the world and Montparnasse was the capital of the avant-garde, the heart of the artistic and intellectual Parisian life. 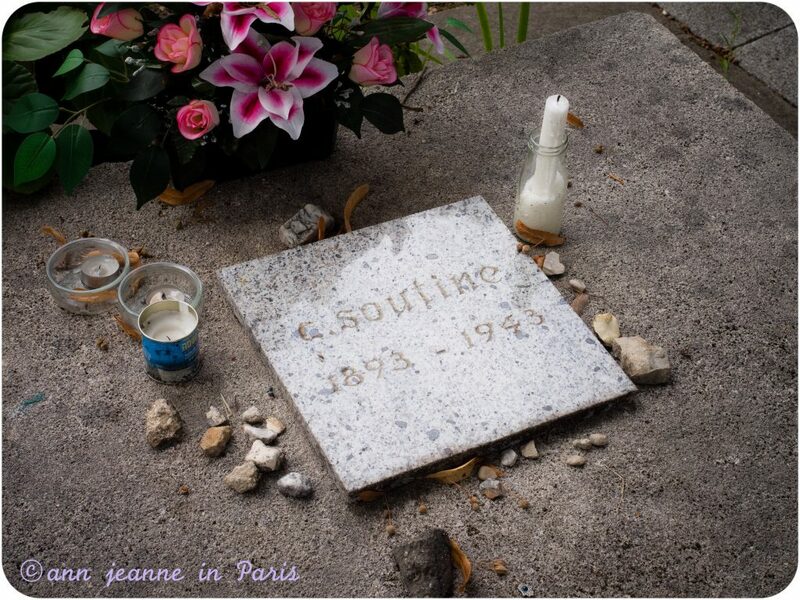 Montparnasse cemetery is the final resting place of many of these artists. 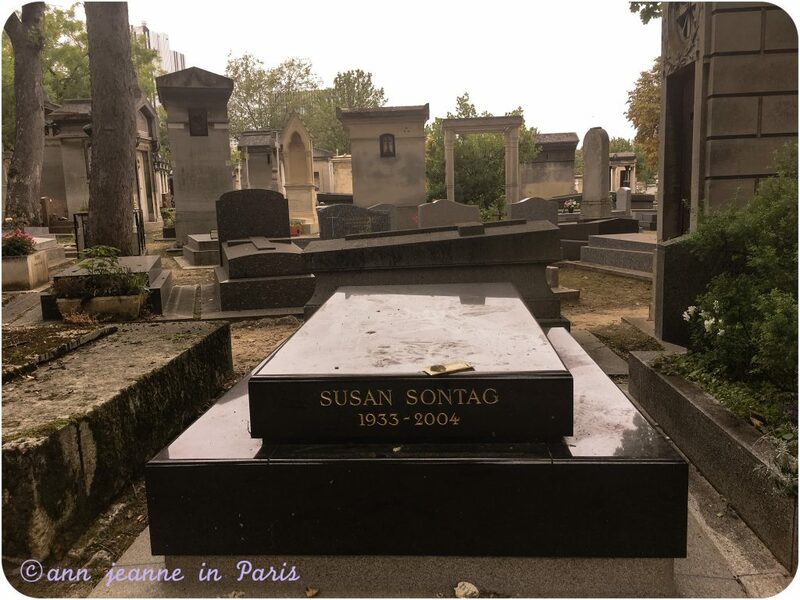 Man Ray, Soutine, Zatkine, Brancusi, Brassaï, Bourdelle … It’s also the cemetery where you’ll see the graves of Jean Seberg, Serge Gainsbourg, Marguerite Duras, Susan Sontag, César (the sculptor), Brassaï, Baudelaire, Guy de Maupassant, Bartholdi, Camille Saint Saens, Samuel Beckett, Eugène Ionesco, Constantin Brancusi Some of them were the illustrious residents of Montparnasse. 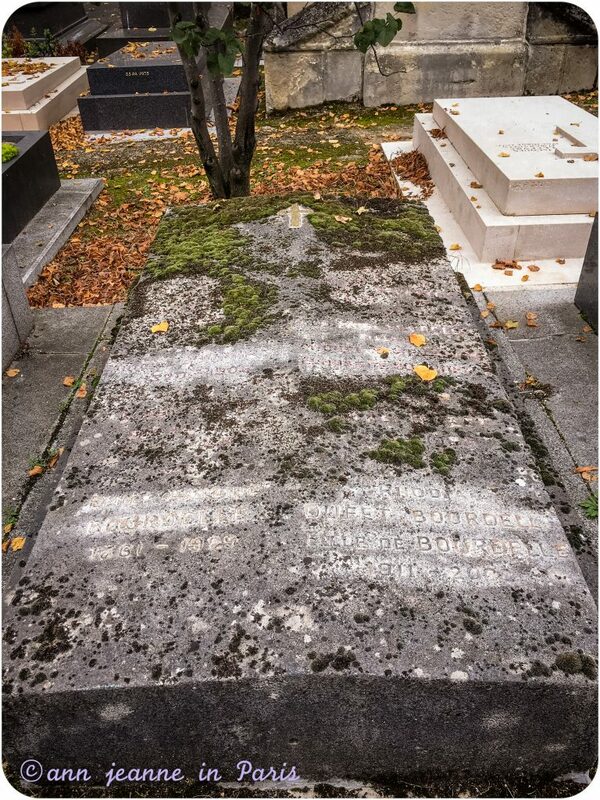 Graves of writers, poets, artists, filmmakers, politicians, actors, publishers, patrons of industry… Many graves of foreigners who have made France their home. 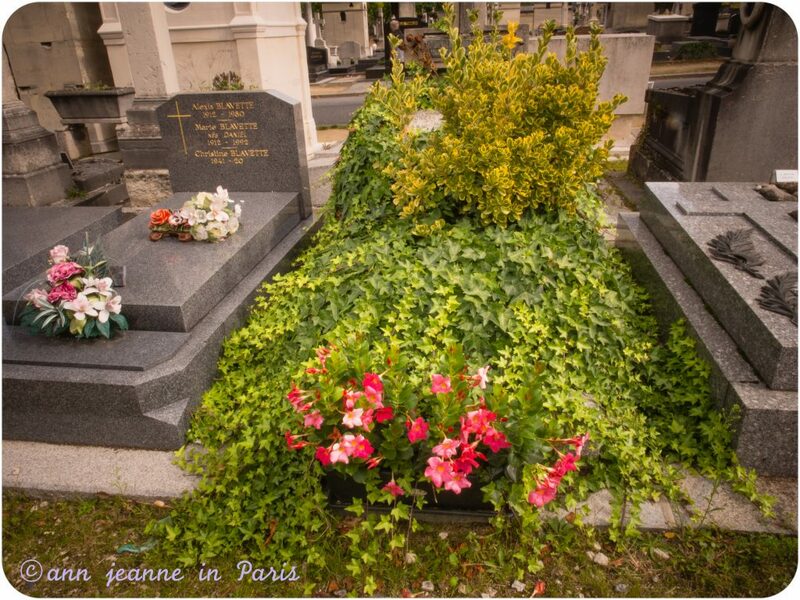 But the graves are tightly packed. 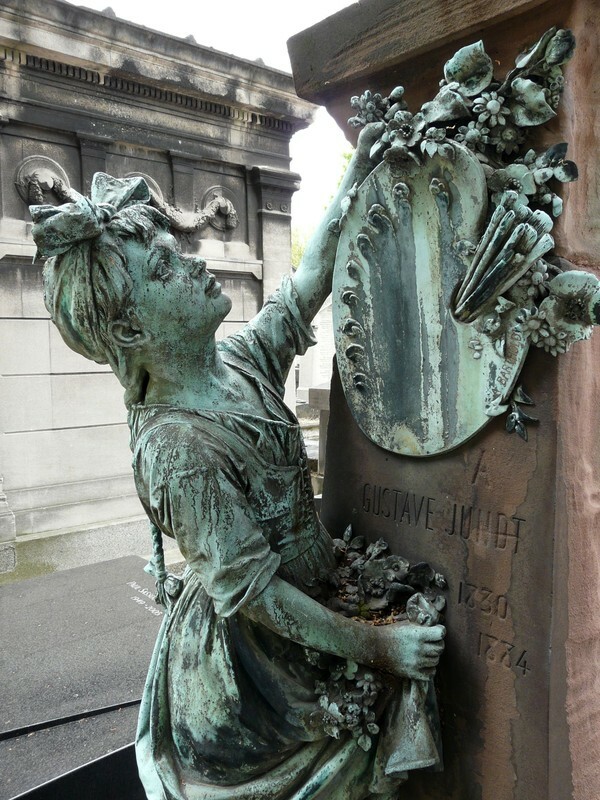 Even though you’ll find a plan of the cemetery at the entrance to help you find the graves it’s quite difficult to get around and find some graves you want to see, . 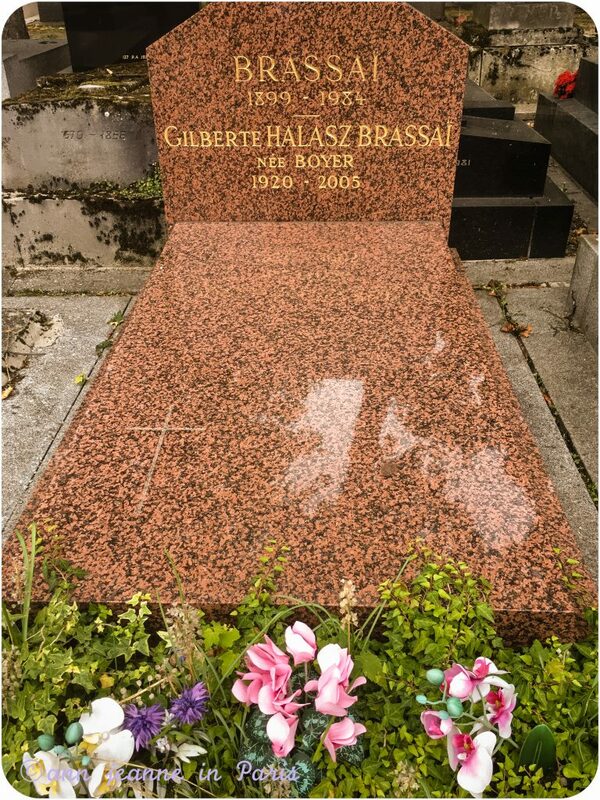 My personal link with Montparnasse cemetery : This is the final resting place of my father. Also where my piano teacher, who taught me (private lessons) the piano since I was 8 to the age of 22, rest. 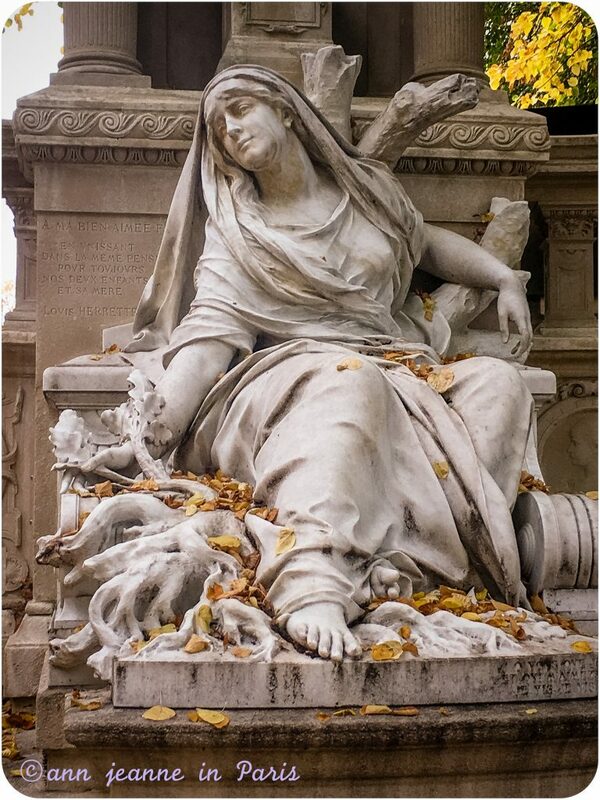 So to me, this cemetery is not like the others… And … it’s nearby my home and in neighborhood I particularly love. 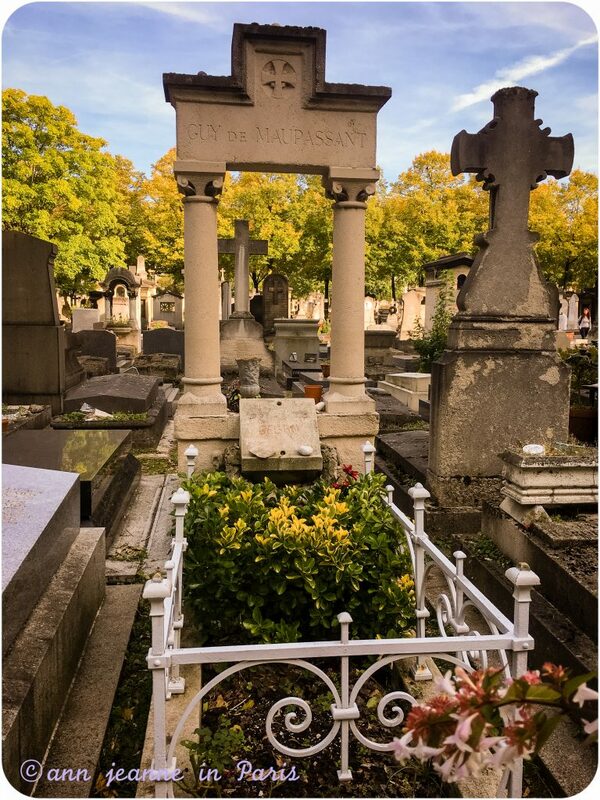 Some History : The cemetery opened in 1824. after the cemeteries closer to the center of Paris, were banned owing to sanitary problems. 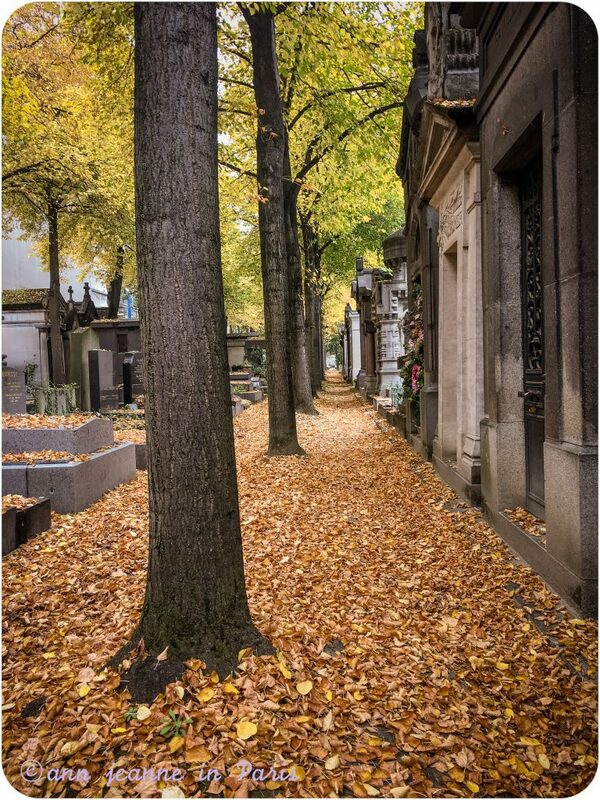 In the early 19th century Montmartre, the Père Lachaise and the Montparnasse cemetery replaced some small ones. 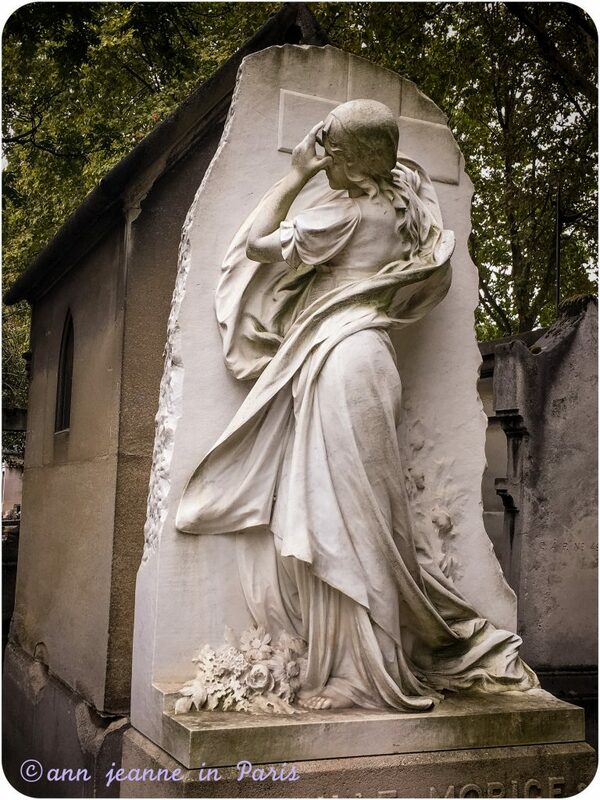 Before being a cemetery, the land of Montparnasse cemetery belonged to a religious community. There was a monastery on the place and an old flour mill. It became national property at the French Revolution (from 1789). 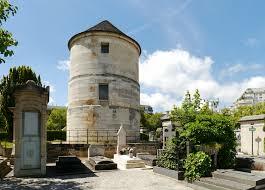 The Monastery was pulled down, but the windmill, “Le Moulin de la Charité” was kept. 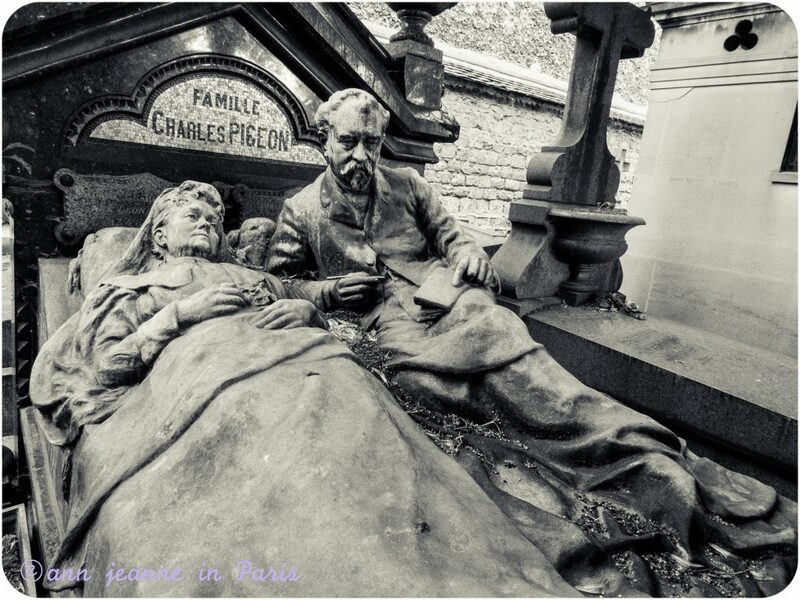 Pigeon Charles’s grave (1838 – 1915) : French inventor of a non-exploding gas lamp. Born in France in Normandy. A life size figures of Mr and Mrs Pigeon (fully clothed) lying in a bed. The bed forms the grave . 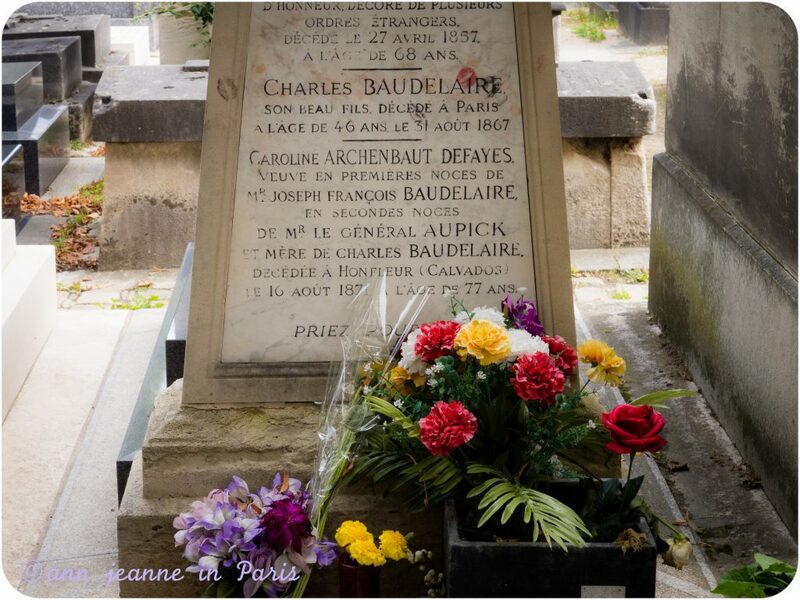 Baudelaire (1821 – 1867): French poet born in Paris where he lived most of his life. 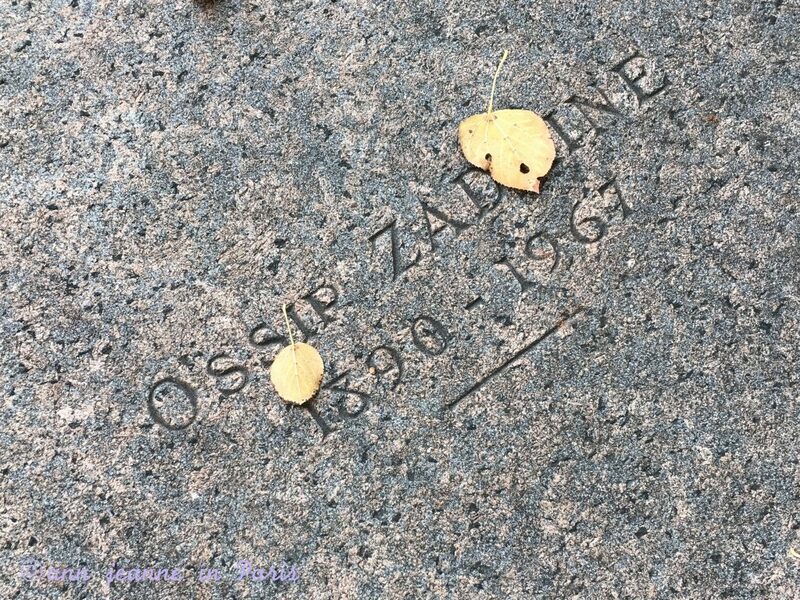 buried with his mother and step-father. Also a cenothaph dedicated to the poet. 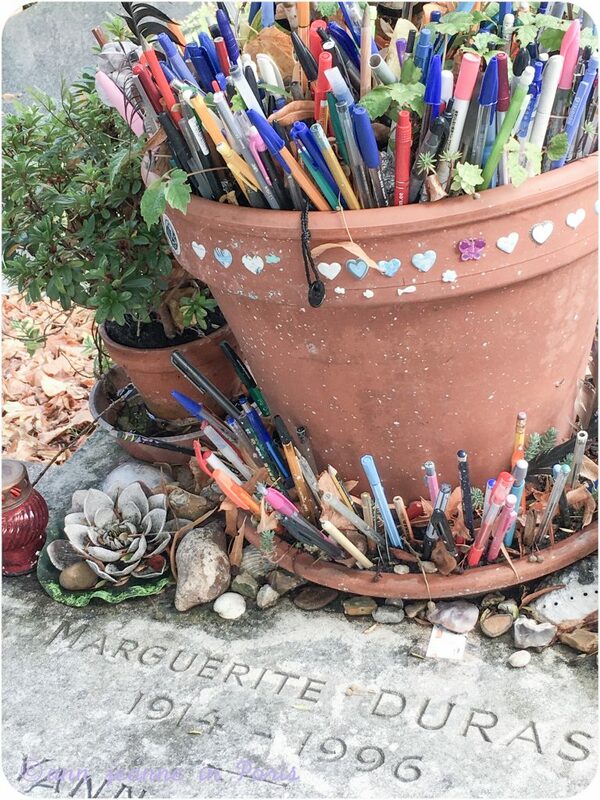 Marguerite Duras (1914 – 1996) : French writer and film director, best known for her novel “The lover” (Prix Goncourt – 1984), which was made into a movie. Antoine Bourdelle : (1861 – 1929) : French sculptor. 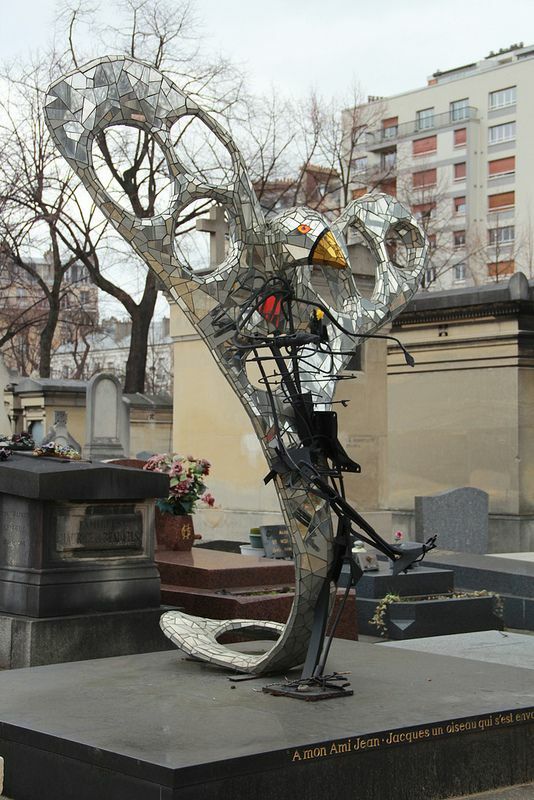 One of the Pioneers of 20th century monumental sculpture. 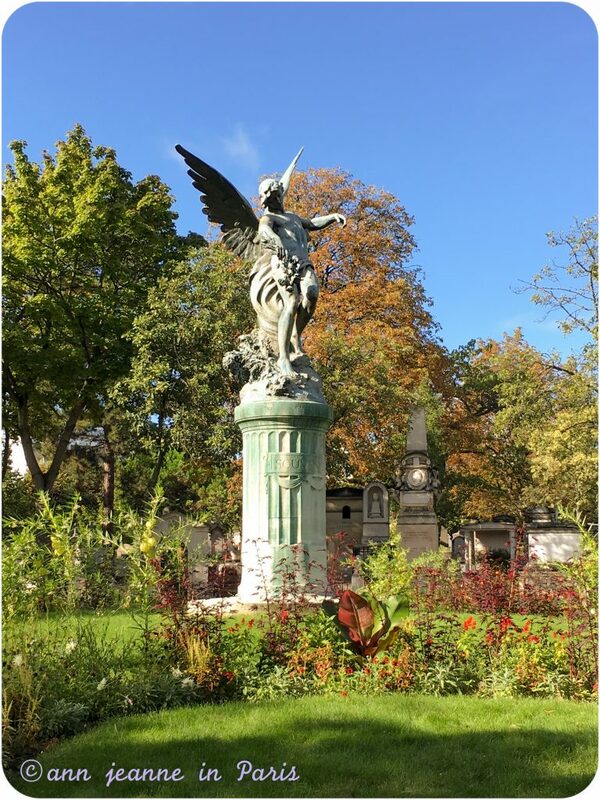 His home and studio where Antoine Bourdelle has been working from 1885 to 1929 is located 19 rue Antoine Bourdelle – Paris 15, and can be visited. Brassaï (1899 – 1984) : Hungarian photojournalist, portraitist. 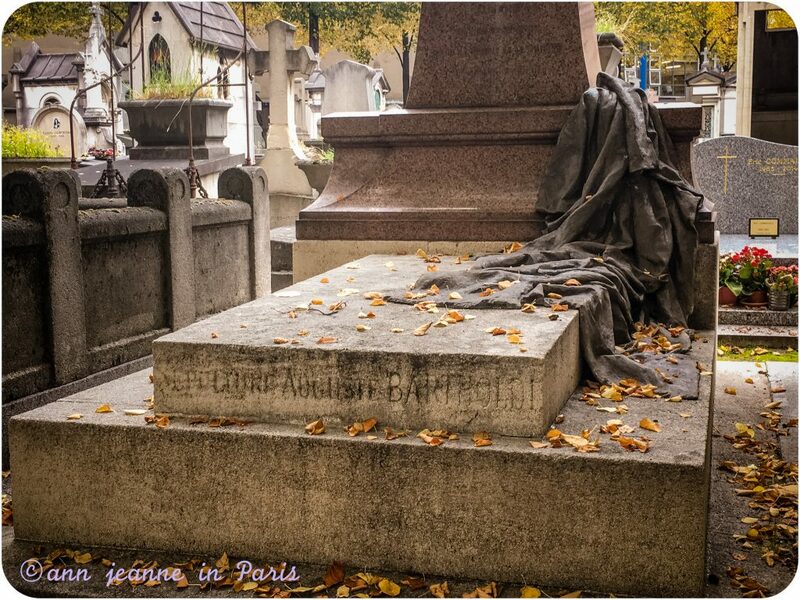 He moved to Paris in 1918 and fell in love with the city. Hi is renowned for his photographic chronicles of the night. 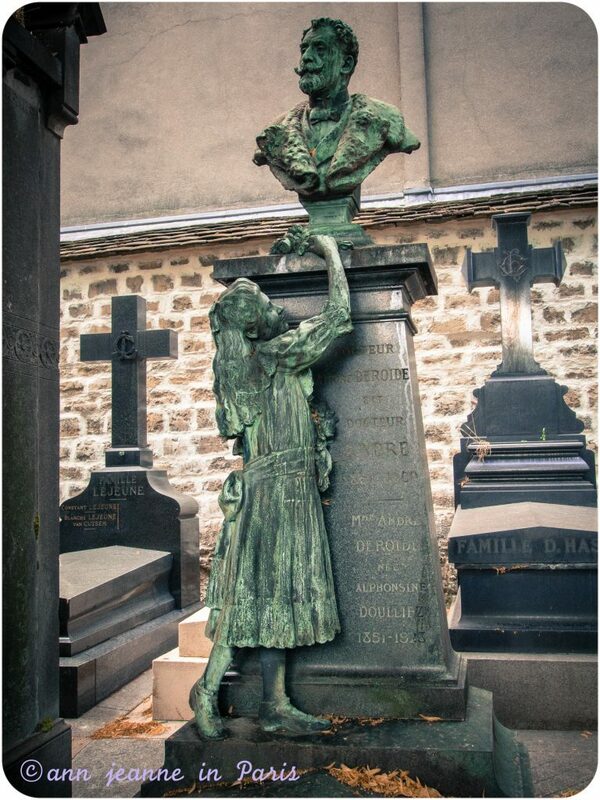 Frédéric Auguste Bartholdi (1834 – 1904) : French sculptor most renowned for the Statue of Liberty. 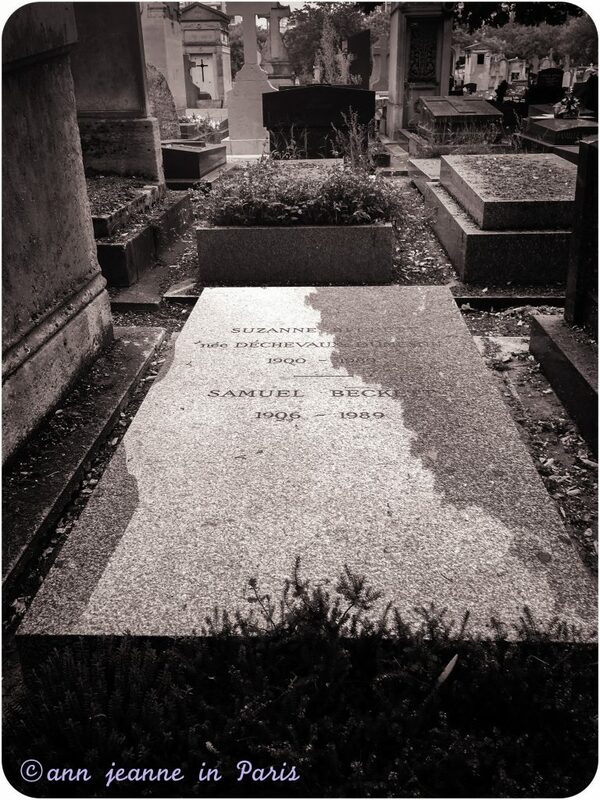 He designed his own grave. 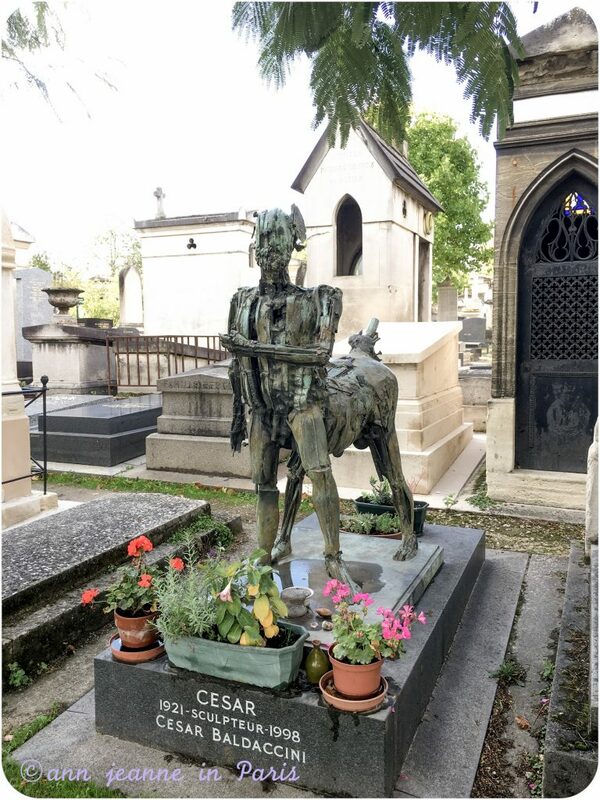 César Baldaccini (1921 – 1998) : French sculptor, better known simply as César. 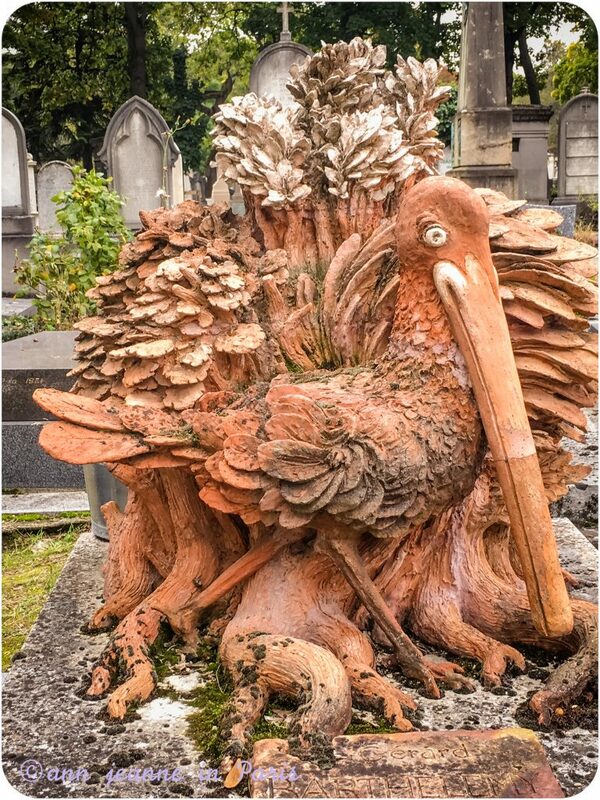 He was at the forefront of the Nouveau Réalisme movement with his radical compressions (compacted automobiles, discarded metal, or rubbish), expansions (polyurethane foam sculptures), and fantastic representations of animals and insects. 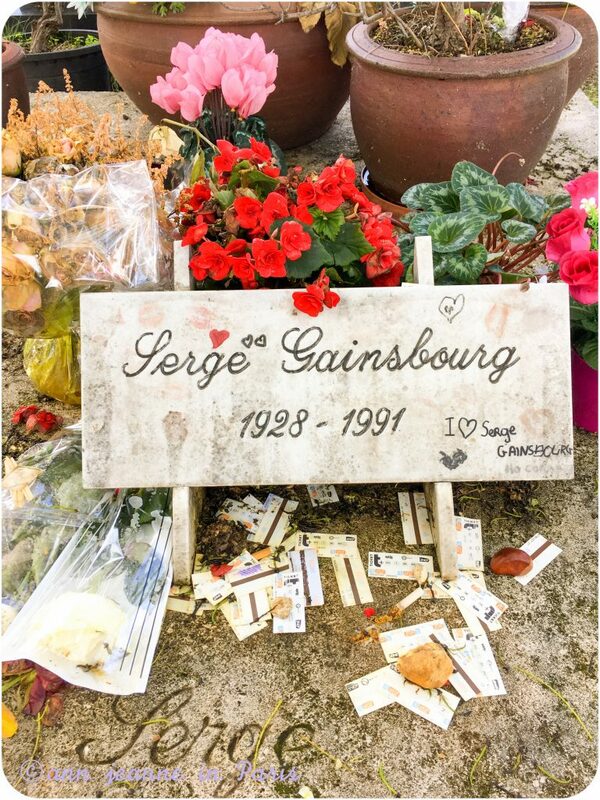 Serge gainsbourg (1928 – 1991) : Songwriter, singer and film maker : one of the most visited graves in Montparnasse. 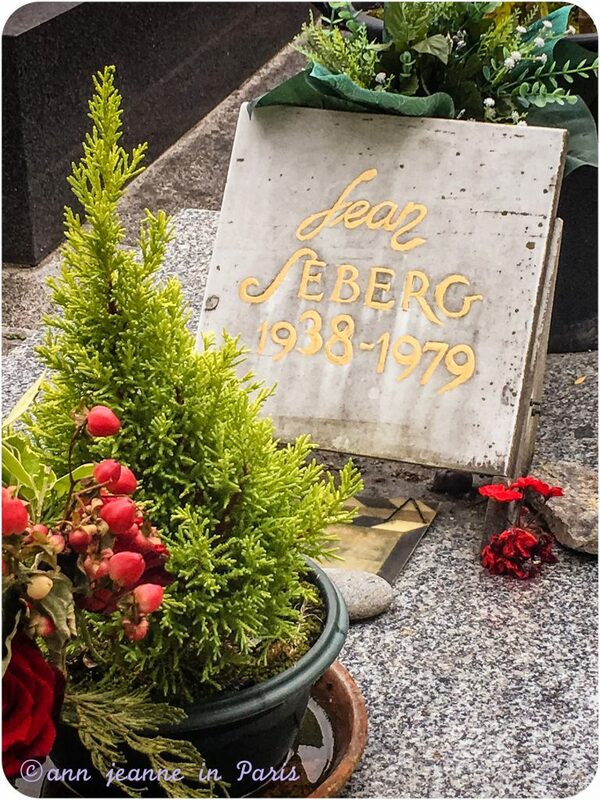 His grave is often covered with different objects which are references to some of his songs : a cabbage (for his LP called “L’homme à la tête de chou”, a metro ticket for his song called “Le Poinçonneur des Lilas”, or cigarettes’ buts because he was smoking a lot and also wrote a song called “Dieu est un fumeur de Havane”. Jean Seberg, (1938 – 1979) : American actress who played in “Breathless” (1959) (director Jean-Luc Godard). 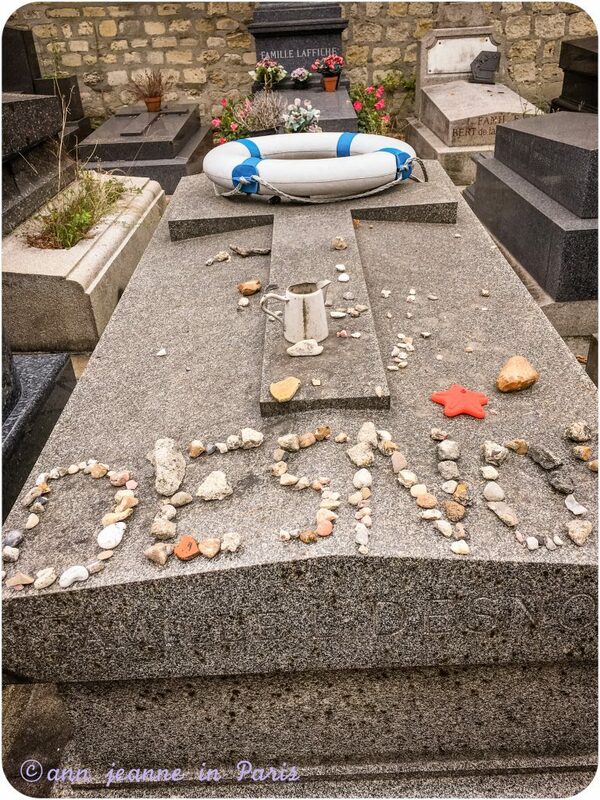 Even with the help of a map, it’s quite difficult to find the graves you’re looking for. 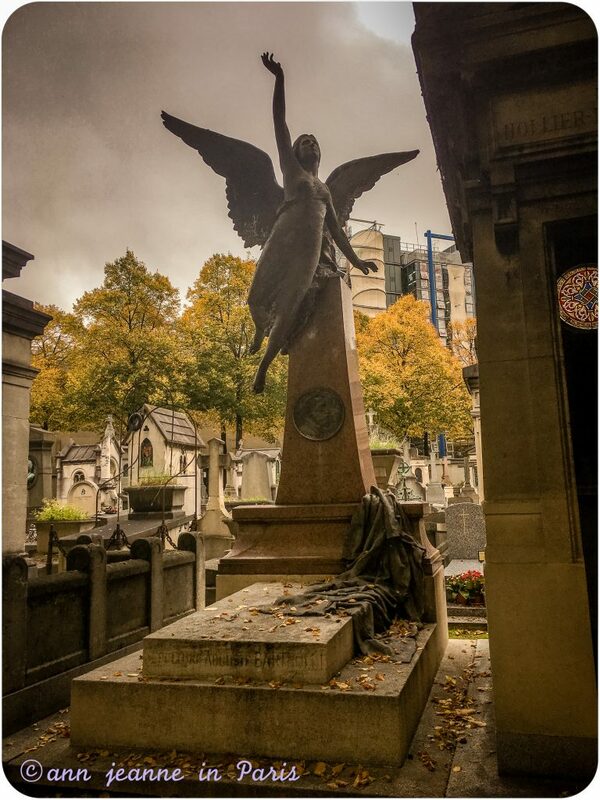 Don’t hesitate to contact me : A visit of Montparnasse cemetery can be included (or added) in the Montparnasse walking tour (= “The Roaring 20’s ) Share my Paris, the Paris I love. I welcome you, I accompany you and we walk at your pace. 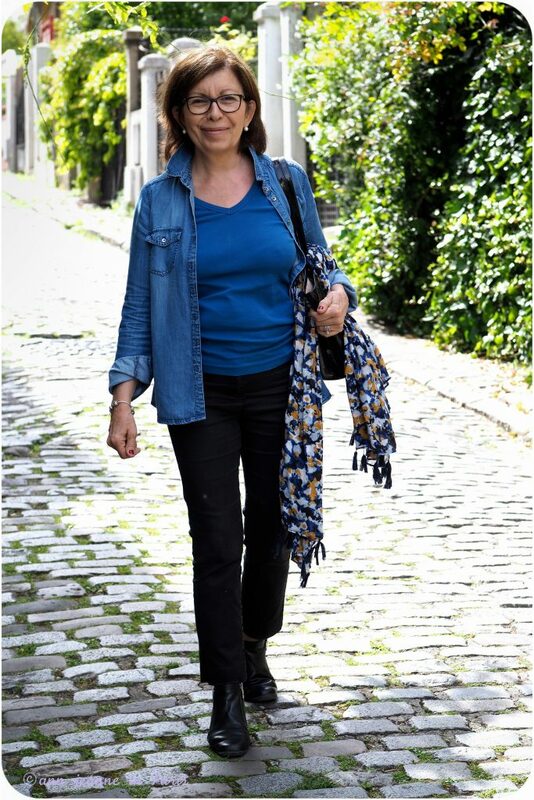 Half a day or a whole day with a native including a break in a very Parisian cafe. 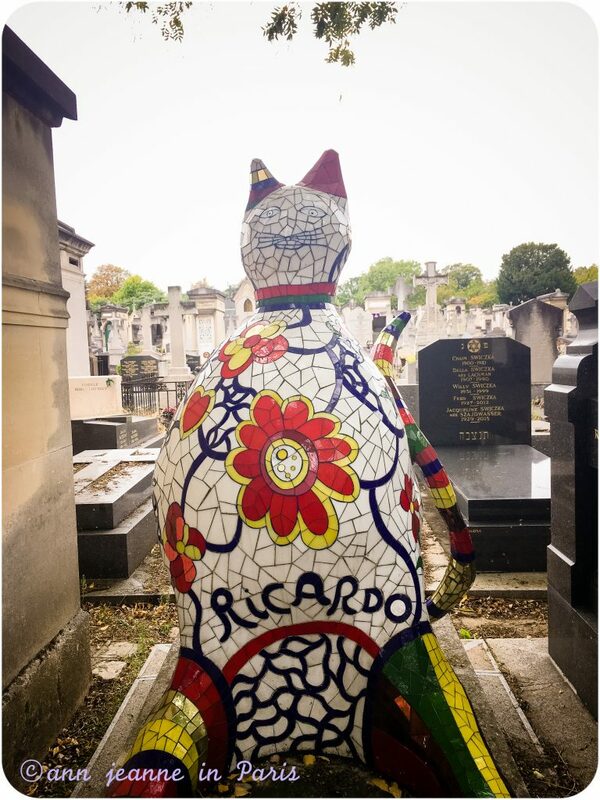 It’s a cross cultural experience in Paris and a way to see Paris in a Parisian perspective. 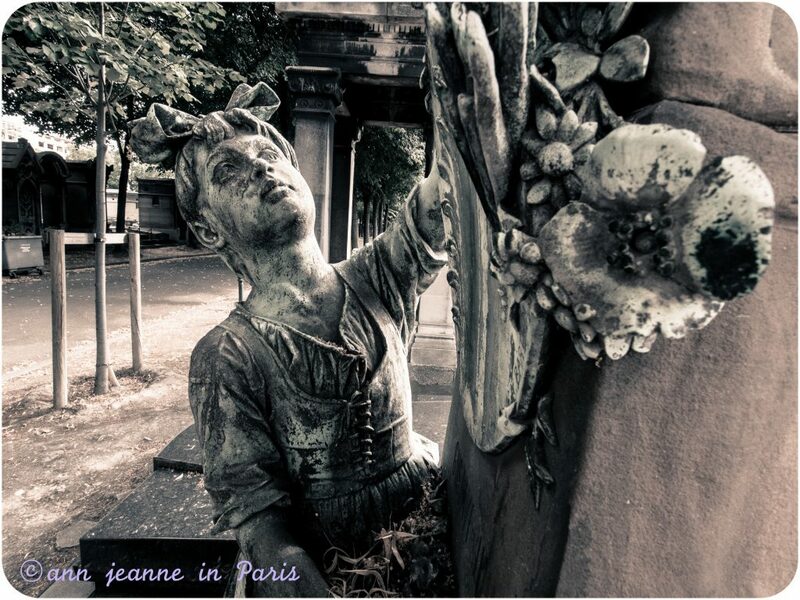 Ann Jeanne in Paris’ private tours are designed for one or two persons. 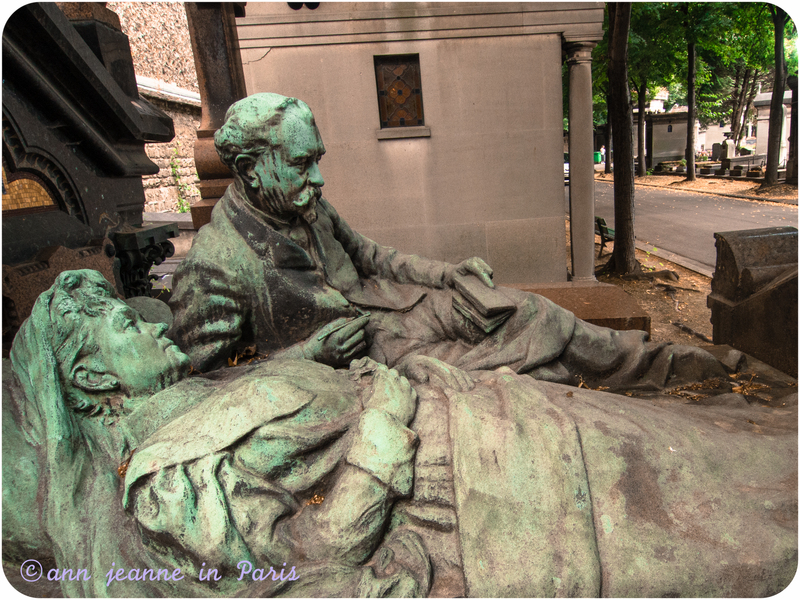 A friendly and personal experience of Paris. I was born and raised in Paris. Paris is city where I live. 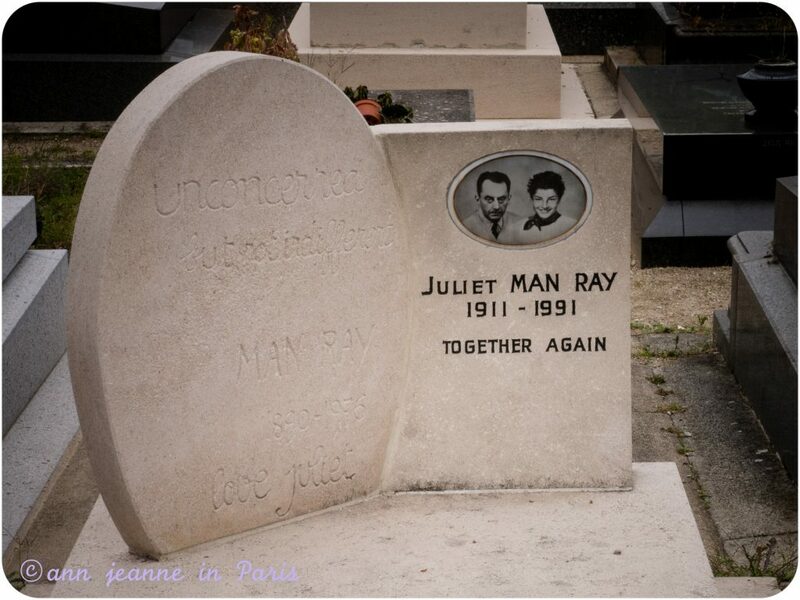 Sorry about my typo montparnasse cemetery!!! 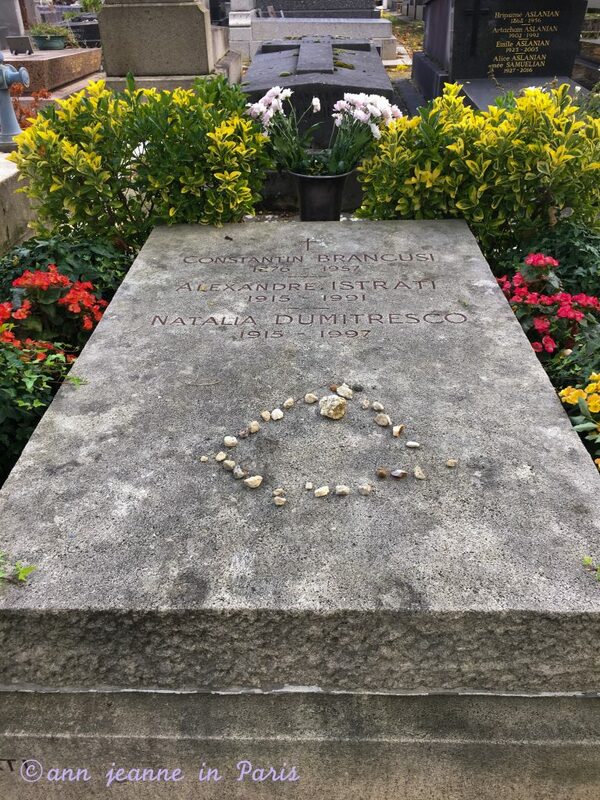 My husband’s aunt and uncle, the actress Daniele Delorme and the director Yves Robert are both buried at Montparnasse Cemetery. Your post brings back a ton of memories. I have so many of the same photos that you have in your post. I feel like I’m back there. Anyway, we were there last year to visit Daniele and Yves graves and had a great afternoon just strolling around. It’s hard for me to believe that in two weeks it’ll be two years since we laid Daniele down to rest and I really miss her–she was a second mother to me. Thank you for a lovely post. It’s great to see a post that you can relate to and I’ve completely related to this to the point that I think my husband and I need to book flights back very shortly!!! !